I slutten av mai 2014 flyttet personale og pasienter inn i det nye sykehusanlegget på Stokmarknes. Resultatet av 14 års planleggingsprosess og 6 års prosjektering og bygging kunne tas i bruk. Arkitekt har vært BOARCH arkitekter as, med undertegnede som fagansvarlig. Tekniske rådgivere har vært Norconsult as og Rambøll as. Nybygget hadde offisiell åpning ved statsminister og helseminister 20. august 2014. Bildene i dette galleriet er tatt på oppdrag for Nordlandssykehuset Senter for Utbygging og er for en stor del publisert i byggherrens offisielle ferdigmelding. 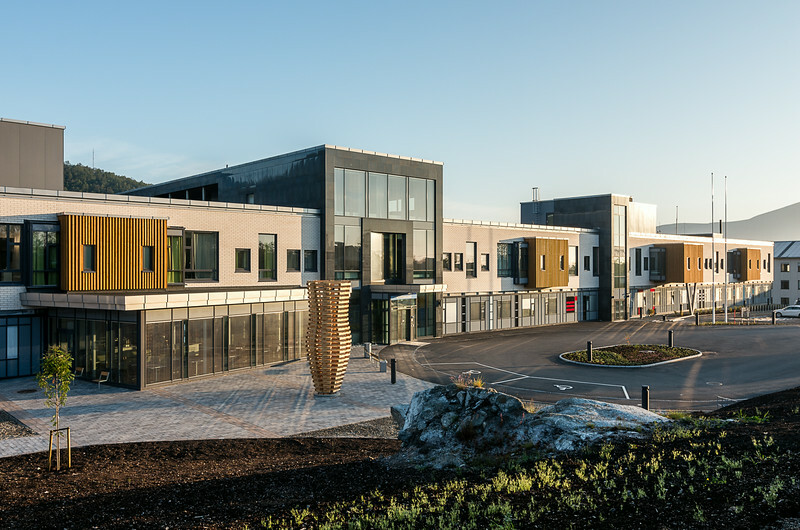 In late May 2014 staff and patients moved into the new hospital facility at Stokmarknes – as a result of 14 years of planning process and six years of planning and construction. Architect has been BOARCH arkitekter as, with the undersigned as leader of the architect team. Engineering consultants have been Norconsult as and Rambøll as. The new building was officially opened by the Norwegian Prime Minister and the Minister of Health on 20 August 2014. The images in this gallery are taken on assignment for Nordland Hospital Center of Development and are largely published in the builder's official publication of the completed building. Østfasade med adkomstplass og hovedinngang.